Series: RRPC Member stories at Christmas Time (1), 2015 Advent Series (5), 2014 Visitor's Sermons (1), 2012 Advent Series (1), 2015 Summer Series --- Beyond the Ark (8), 2015 Lenten Series (5), 2015 Visitors Sermons (6), 2015 RRPC Sermons (24). Service: Sunday Morning (48), Special Service's (1), Memorial Services (1), Christmas Eve (1). Psalm 23:1-6 (Part of the 2015 RRPC Sermons series). Preached by Dr. Jon Fancher on December 4, 2015 (Memorial Services). Luke 17:11-19 (Part of the 2015 RRPC Sermons series). 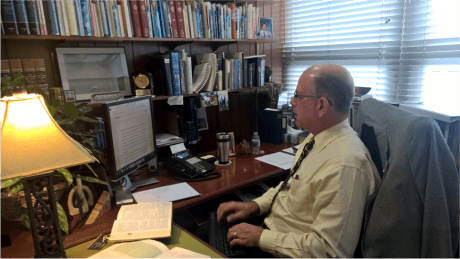 Preached by Dr. Jon Fancher on November 22, 2015 (Sunday Morning). John 6:28-29 (Part of the 2014 Visitor's Sermons series). Preached by David Hensel on November 15, 2015 (Sunday Morning).